The Exclusive Option Leather Gauge Cluster Surround features a rich leather wrapped surface. 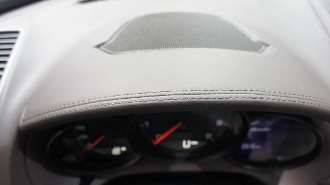 This rare trim was an option that was available by Porsche only as part of an expensive extended leather dash package. The standard plastic gauge bezel is replaced with leather in a matching color. This is also a great opportunity to add a splash of accenting color to enhance and highlight the gauge cluster of your Porsche.